WASHINGTON — Stratolaunch revealed new details Sept. 27 about a rocket engine it is developing for use on future launch vehicles that will fly from a giant aircraft approaching its first flight. The PGA engine — its name taken from the initials of Stratolaunch’s founder, billionaire Paul G. Allen — will use liquid oxygen and liquid hydrogen propellants with fuel-rich staged combustion and a thrust of 200,000 pounds-force. That engine, the company said, will have the highest specific impulse, a measure of efficiency, of any engine, but did not disclose a specific value. Liquid-oxygen/liquid-hydrogen is one of the most efficient chemical propulsion combinations. 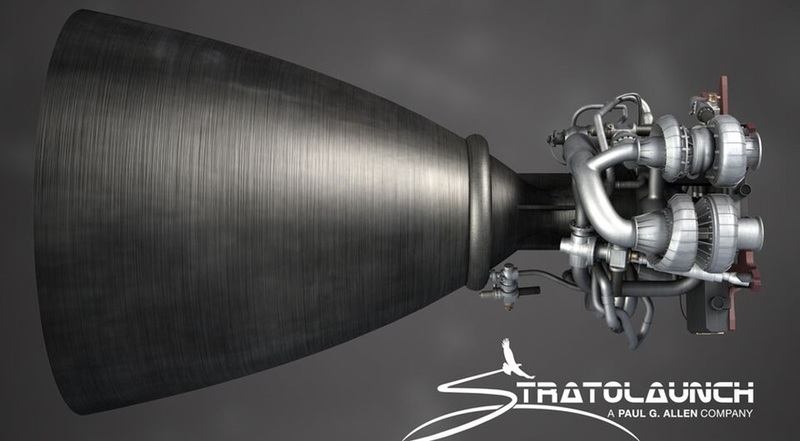 Stratolaunch is currently working on the preburner for the PGA engine, the smaller of two combustion chambers in a staged combustion engine. In a fact sheet, Stratolaunch said it plans to perform a “full-scale” test of the preburner by the end of this year at NASA’s Stennis Space Center in Mississippi. While this announcement has provided the most details to date on the company’s engine development plans, there’s been evidence for some time that the company planned to embark on developing its own engines. In 2017 the company hired a former SpaceX executive, Jeff Thornburg, as its vice president of propulsion. It also signed a Space Act Agreement last September to perform engine testing at Stennis. In August, the company disclosed that it was planning a family of air-launch vehicles that would use the company’s giant airplane. Besides previously announced plans to use the Pegasus XL rocket from Northrop Grumman, the company said it was developing its own Medium Launch Vehicle capable of placing up to 3,400 kilograms into low Earth orbit. A “Heavy” version of that vehicle, with three first stages like the Delta 4 Heavy or Falcon Heavy, capable of placing up to 6,000 kilograms into LEO. Those vehicles will use the PGA engine, although the company did not disclose engine configurations for those vehicles. The company also didn’t reveal a timeline for the engine’s development, but the company previously said its Medium Launch Vehicle would make its first flight in 2022. Work on the company’s large aircraft continues at the Mojave Air and Space Port in California, where observers recently spotted the plane performing a taxi test on one of the airport’s runways. Company officials said in April that they planned to perform several more taxi tests before attempting the plane’s first flight, then planned for later in the summer, but have not disclosed an updated schedule.